"I have been working at the Blind Children's Learning Center for twelve years, and it continues to be exciting to receive your materials. We use them in our classroom on a daily basis to help our students achieve their goals. We are a preschool which has 'reverse mainstreaming' – classrooms have sighted as well as blind and visually impaired children who use your materials to learn different concepts." 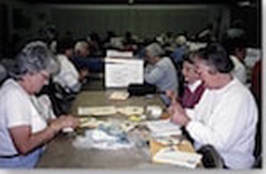 The Visual Aids Workshop is unique to Oakmont Village, an Active Adult Community in Santa Rosa, California. It is the inspiration of Winifred Thiltgen, who retired in Oakmont. The cover and pages of each book are hand lettered with primary school printing for children who are partially sighted or mentally challenged. Every page has a tactile illustration. Members joke about returning to kindergarten as they cut and glue the many pieces. Covers are handmade with cardboard and wallpaper from outdated sample books. 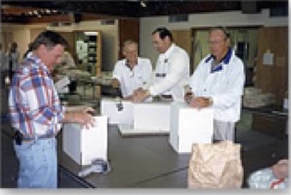 The Workshop is the fortunate recipient of two Thermoforms — one from the Thermoform Corporation, and one from the Petaluma Transcribers group. They have proven invaluable in the creative hands of our engineer-member. Basic Braille cards were file cards with each dot glued on by hand. Now they are made with the Thermoform, as are two of our games. Originally there were eight wooden items among our Aids. First they were made by Oakmonters in their garages, and later, in the carpenter shop of the Sonoma Jail Industries. When that shop closed our engineer-member devised ways to copy them using the Thermoform. 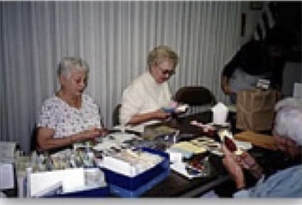 Monday mornings find a large Oakmont community room filled with over fifty people diligently creating Tactile Aids. Each item is made by a group of two or more members. Braillists, printers, and others also work at home during the week so that materials are ready for completion on Mondays. There she saw a visiting artist demonstrate books for blind children. The idea clicked, as during her teaching career, visually impaired children were mainstreamed in her classes. Winifred visited local teachers of the visually impaired to learn about specific needs. 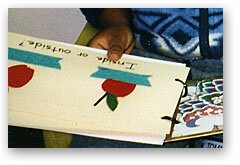 ​Ten friends joined her, and the first year they made eighteen books with tactile illustrations. In 1971 the Oakmont Visual Aids Workshop was born!! Winifred passed away in 2002, but the Workshop she founded lives on. Suggestions from teachers at California Teachers & Educators of the Visually Handicapped Conferences led to the creation of other kinds of Tactile Aids. Among them are cards to teach Basic Braille, items to assist with Math Study, and several games. As all items produced are Brailled, the Workshop was fortunate to find several proficient Braillists in Oakmont. Three Workshop members learned to Braille in order to assist. The generous contribution of two electronic Mountbatten Braillers by the Northbay Lions Club in 1996 has relieved our Braillists of some of the tedium of repetition. Paired with computers programmed by our engineer-member, the ease, speed, and efficiency of these electronic Braillers greatly aid production. About every four or five months, the workshop has a Mailing Day. All completed Aids are laid out on tables and gathered for each individual order. Often 100 boxes are shipped. Since 1971, over 100,000 Tactile Aids have been sent free of charge to educators of visually impaired children throughout the world. We receive donations of materials from local framing shops and wallpaper stores. We also receive money for supplies from organizations and many individuals. We receive no government support except for the international agreements that allow free postage for materials for the blind. We welcome your tax deductible donation to aid our efforts.